Poker superstar Phil Hellmuth has decided not to play in the $125,000 buy-in PartyPoker.com Premier League Poker V in Vienna early next month. Hellmuth – who is known as The Poker Brat – was expected to join the likes of Phil ‘The Unabomber’ Laak, Tom ‘durrrr’ Dwan, Daniel ‘Jungleman’ Cates, Luke ‘FullFlush’ Schwartz, Sam Trickett, Team Party Poker Pro Tony G, Team PokerStars Pro Vanessa Selbst, Andy Frankenberger, Erik Seidel and Patrik Antonius for the April 4 to 10 event in the Austrian capital city’s Montesino. However, the 47-year-old American – who has played in the majority of the Premier League of Poker events – will not be among the 16-player field when the event kicks off next month. The 11-time World Series of Poker (WSOP) bracelet winner enjoyed his best run at the event back in 2007 when finishing third at the final table after winning four of his six group matches. That inaugural series was ultimately won by Finnish star Juha Helppi for $125,000 – and maybe Hellmuth has decided that enough is enough for now following so many disappointing results in the Premier League. It’s an understandable decision, considering the star-studded line-up that has already been assembled for the latest series. 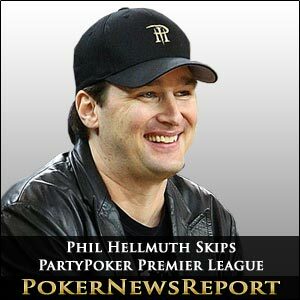 But, really, Hellmuth should be making a real go of it to clinch his first Premier League crown. Certainly, the irascible Hellmuth has not received any great support from ‘arch enemy’ Tony G, with the Melbourne-based Lithuanian taking this opportunity to get in a few digs at the easily angered American. The 38-year-old highly aggressive pro decided Hellmuth’s decision to give the Premier League a miss was ripe for some fun at his PartyPoker blog, writing: “He hasn’t got a sponsor and he doesn’t have the bankroll or the heart. Is This Just the Opening Skirmish? This could well be just the first salvo in another war of words between the two explosive pros – although it does appear Tony G has the upperhand when it comes to antagonising Hellmuth. Let’s hope there’s some more blasts from both pros as there isn’t anything quite like the unfriendly fire that takes place when Hellmuth and Tony G face-off, especially when the teasing takes place at the felt of a live tournament. Meanwhile, the 16-player event – which will be produced by Matchroom Sport and presented by beautiful Team Party Poker Pro Kara Scott – will run ahead of the April 10 to 15 PartyPoker.com-sponsored World Poker Tour (WPT) Vienna €3,500 buy-in main event, while the Party Poker Big Game VI kicks off on April 11 for a 48-hour tournament. If, unlike Hellmuth, you do fancy taking on some of the world’s biggest pros in the Premier League, there are nine qualifying-round places available at Party Poker through six weekly satellites, daily qualifiers and freerolls. But don’t delay as there is a midnight, March 18, deadline. The winners will be given $13,000 packages for the qualifiers that include a $10,450 seat at the televised play-off, four nights’ stay at a sumptuous hotel and $1,350 in cash to spend.